A Local Ecumenical Partnership between the Methodist Church and the Church of England. 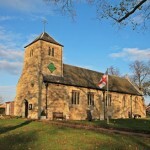 St Michael’s is situated in the heart of the rural village of Thorpe on the Hill. Occasionally some service times are slightly altered due to the rural location of the church. Please get in touch to check that the time of the service you wish to attend. Alternatively, please see the plan for further information on weekly services. To find out more about Thorpe on the Hill Ecumenical Church, or to enquire about hiring the church building, please head over to our contact us page or email thorpeonthehill@lincolnmethodist.co.uk to contact the minister.